Its been two days since I finally went into town and so far it has only not been all that eventful, during the first day I spent a good amount of time scavenging and managed to scrape together enough to buy the parts needed to fix the Irradiator, thanks in part to a rather peculiar ghoul (one who for some reason seems to always be chewing a squeaky bone ) who pointed out a few good spots to look, I made sure to return the favor. I bought the parts off of a rather... short dragon, both in temper and in stature. He seemed to take issue with the peculiar ghoul. I briefly met two other ponies as well, one was a rather... friendly green unicorn in a hazmat suit, the other a grey earth pony with whom the green one seemed determined to befriend. The second day has so far been somewhat more eventful, I found both a old portable gaming device, and a screenplay for a movie sequel, both of which may have some value to a collector. The best part though has been the other items which I have managed to find, an old 10mm pistol (which ought to get me a few caps), a rather dull sword and its sheath (which is still an improvement over my bare hooves, perhaps I can find a sharpening stone somewhere), and last but best of all a very old suit of power armor. It is built along the lines of a single pony tank which while currently broken ought to be very useful once I fix it up. I did manage to take it apart and stash the pieces in a small cave a short way out of town, one which I then spent a good amount of time concealing. There are few landmarks visible so finding it again shall be quite easy, for me at least! 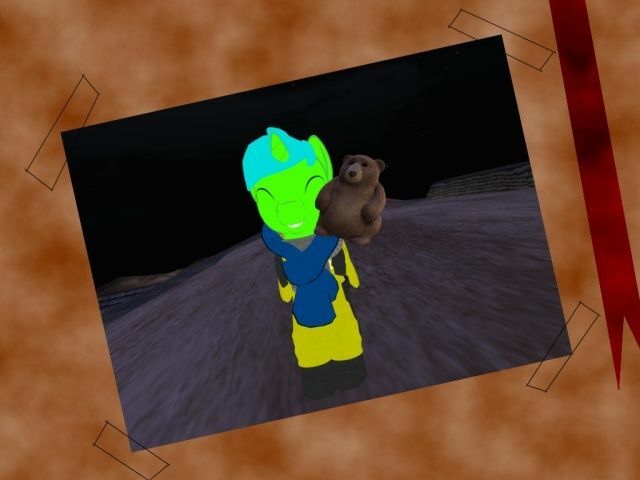 As a side note I may have befriended or at least started to befriend the green pony, whom I learned is named Derp (It seems to be a rather fitting name to say the least), I helped him with his scavenging, perhaps he will return the favor in the future? Either way there is one less pony I hope will be aggressive or at least as aggressive should anything occur to incite them. Sadly I still have no leads on my father or the "Singularity" Hopefully this will change in the coming days. For now I am ending this entry, I need to try and remember to update it everyday, who knows what may happen to stop me from doing it? I don't want to have a multi day backlog of entries waiting for me. Three days in and still no sign of dad, I have yet to actually ask around so perhaps doing so in the coming days will bear fruit. Managed to find an assault riffle, some leather barding, a pecuilar teddy bear, and a box full of caps today. Traded the teddy with Derp for a pile of junk, which just so happened to contain bobby pins. The stallion was overjoyed over the bear, naming it "Clunky". I took a picture of him with the old camera dad gave to me. This means it may be a bit easier to get ahold of some better gear if I can find any locked away. As for the assault riffle and armor, I will likely try to trade them or sell them. Had a seemingly decent idea, if I can find the best places to scav each day, I can likely convince other to pass me what ever crappy bits of gear they find in return for showing them. I could also hire myself out as an extra gun or too help watch someones back. Point being no matter what I need to find someway to bring in caps since as it stands I am broke. One other event of interest has also occurred, I have heard rumors about the location of the "Singularity" which means I may have a stepping stone for finding dad!